Hump Day lovebugs, we're getting there. Today let's brighten up the day with some tropical styles. I'm not saying let's go to the beach, but something between the Bahamas and the office. 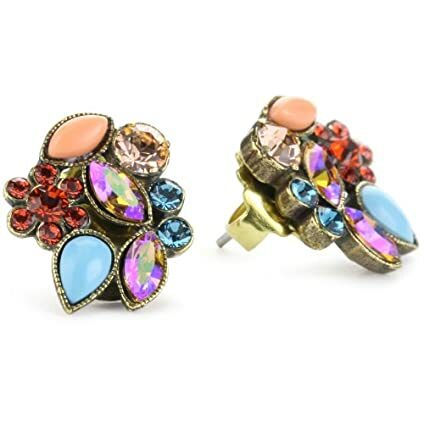 How fabulous are these studs? So colorful and so much fun for an LBD or a pair of jeans. I love the color of this silk shirt and the black cuffs are quite unexpected. Great price for a really unique item. I love the orange. You don't need a margarita to wear this scarf but boy wouldn't that be nice? Tropical prints are huge this season but I find it hard to mix them into my work wardrobe. Try a piece with a smaller print or use tropical colors vs prints to start the trend in your style. That scarf is such a beautiful print!